In a letter to Councillor Cook the Putney Society has lobbied for five local one way streets to allow two way cycling. "The plan below shows the degree of inconvenience experienced by cyclists living in proximity to the High Street. 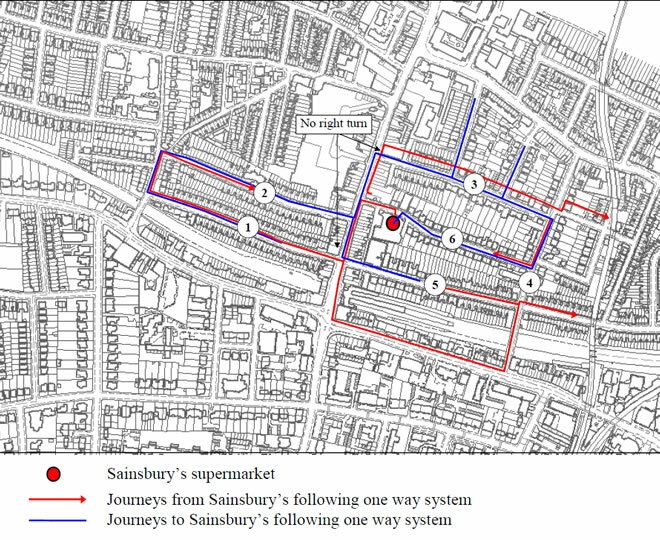 Taking Sainsbury’s store on Werter Road as a typical daily destination, the plan illustrates that the one way system on the above mentioned roads involves lengthy detours for cyclists. The blue lines illustrate the outward journeys to the store from locations in the vicinity while the red lines show the return journeys." The table below the map estimates the distance of these journeys and shows that in some cases the outward and return journeys differ by a factor of up to 5. 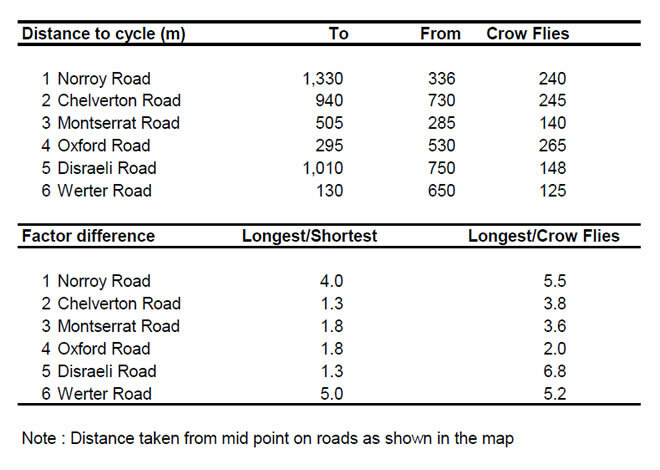 The table also compares the longest cycling journey with a “crow flies” distance and reveals that in the case of Disraeli Road the former may exceed the latter by a factor close to 7.
so than is the case with traffic approaching from the rear. and there were fewer cars, the need for one way systems might no longer be necessary. restrictions to movement as the problem is not of their making."